There seems to be a pattern emerging of late with various disasters occurring around the new year/January period. Last year it was the Haiti earthquake, the previous year it was the Victorian Bush Fires and this year the floods in Queensland and in Victoria. This recent disaster seems to be riding the tail of the last lunar eclipse which occurred during the Summer Solstice on December 21st. Lunar eclipses are points of reference in times of change and the energies can be quite unpredictable and often associated with natural and man-made disasters. The total lunar eclipse on the 21st December 2010 was an extremely powerful trigger. According to various astrological reports this eclipse was conjunct and parallel to the nodal axis and coupled with the longitude conjunction to Pluto, acerbated the flooding particularly as its declination was also overhead Northern Queensland. In addition to the Australian floods there have also been devastating floods happening in other parts of the world, Brazil, Pakistan, Germany and Sri Lanka. The state of Queensland has been hit by record flooding since Christmas, when tropical cyclone Tasha hit the coast on December 24 2010 near Cairns. Precious lives have now been lost and many people are still missing. This has been reported as the worst flooding in Australian history and a similar scenario is currently happening in Victoria. It is going to take a while for everyone to fully process what has happened and it will take some considerable time to rebuild the homes and the hearts of the people that these floods have affected. Australians are however, tough and resilient people and I know that they will have the determination to restore their lives and their homes. Let us all now unite in thought and deed and send assistance and healing in whatever form we can, whether that be through donation, energetic healing, reiki or prayer. It was the last circle for the year and we were celebrating Litha/Midsummer under a Gemini Full Moon. We all gathered in the car park on this warm summer night under the glorious full moon to honour the earth. The sky was clear above us and we connected to the surrounding trees and the cool earth beneath our feet. On this night fires were lit as the ancients did so long ago. Two fires were set up outside near the doorway, one was a wormwood fire. Each person had to pass through the two fires to purify themselves before entering into sacred space. As we moved into the ritual room we walked the circle to experience the elements within each quarter starting with Air, Fire, Water and Earth. The wormwood fire, now extinguished, was brought inside to enhance the cleansing process of the ritual, and was so effective that we continued our ritual under a blanket of smoky haze for most of the proceedings. The circle was then cast with a sword and the element within each quarter was activated. "We honour this time of the year at the apex of the waxing year and the start of the waning year. As the year changes the Gods change." To show my dedication To You. After each dedication was said out aloud, it was followed by wild exuberant shouting and drumming. When the last dedication was made we all danced, energetically banging drums and making noise to allow the energy to be raised so that our dedication could be sent to the Gods. After relaxing and discussing our experiences we then thanked the Gods & the Goddesses for attending our circle and we closed the quarters. We then ended the year with this salutation. "Today, at Litha, we celebrate the life and love of the Gods and of the Earth and Sun." The residual energy was then grounded back into the earth and forwarded to individuals for healing. The circle was closed and then we all finished the evening with our Litha Feast. More information regarding this circle and past circles can be found in our Book Of Shadows. Our next Full Moon Circle will be held near Engadine on Friday February 18, 2011. Please contact us for further details if you would like to attend. Each year SOL holds an end-of-year dinner, inviting circle members, friends and family along for an evening of fun and friendship. Once again we had a picnic/bbq on the foreshores of the Woronora River. Click on the image below to see a collection of "happy snaps" taken on the night. Members of SOL plus other close friends and family gathered together at Stanwell Park for a very enjoyable BBQ picnic on New Year's Eve, which was followed by our ritual on the beach, where we had a bonfire near the water's edge. As the moon on this night was in the waning phase, very close to the dark moon, it was appropriate to do a cleansing ritual in preparation for the new year. Some of us got our feet wet at the water's edge as the ocean waves felt so very cleansing and refreshing and were symbolic of washing away all the 'dirt' from the old year. We wrote on pieces of paper all that we wanted to discard from our lives in 2010, then burned the papers in the bonfire. 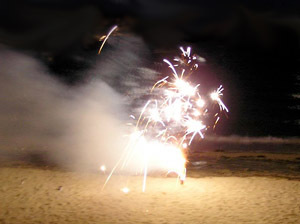 We welcomed the new year with a toast to the gods and goddesses and restated our affirmations we had spoken at the last SOL full moon circle, 2 weeks earlier, and enjoyed playing with sparklers then watching the displays of fireworks at midnight provided by the many other people camped on the beach for the evening. With fireworks going off in a number of locations nearby and numerous bonfires dotted around the beach it was a very magical evening. What is happening in 2011? We begin 2011 by looking for more input from our readers. Let us know what is going on in your part of the community so we can advertise your events on our website and in Axis Mundi. We invite you to also send an email to the editor letting us know about something you especially liked or didn't like about our articles. We appreciate readers' ideas. If you see something that you think might be an interesting topic, just give us a call, or drop us a line. Full Moon Circles - Spheres Of Light holds regular Full Moon Circles near Engadine (Southern Sydney, Australia) on the Friday before each Full Moon . These Full Moon gatherings are Open Circles, meaning that all Pagans are welcome to come along any time and experience a Full Moon circle with us. 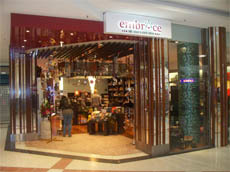 Our first circle for the year will be on Friday 18th February 2011. WHAT TO BRING: a plate of food and/or drink (non-alcoholic) to share at supper afterwards. WHAT TO WEAR: neat casual attire - cloaks/robes/ritual clothes may also be worn if desired. COST PER CIRCLE: $10 per person to help cover hall rental and other ancillary costs. Meditations in the Park - Meditate in the beautiful surrounds of The Royal National Park. - Our meditations will be conducted every third Sunday of the month at 9.00am. SOuL Searchers will also be organizing some interesting paranormal tours during the year. Upcoming tours and dates will be published on the website and in the Axis Mundi. Proposed Workshops - Venues & dates will be advertised regularly in the Axis Mundi, Face Book and on our Website. Warm summer breezes stir the trees. 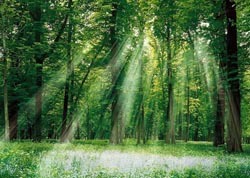 The light dances with the shadows as the green leaves move and old branches creak. Animals stir slowly in the heat as though reluctant to move as the Summer sun beats down on the canopy above. High over head a lone eagle cries as it drifts on the warm currents. Scurrying paws move around the base of the great trees. Deep in the ancient and timeless forest they move. Deeper than man has ever trod. Here is the Summerland. Here are the places were magick rules. Here there is a clearing. Water flows by as it cascades over rocks that have been polished by countless seasons. A constant flow of life through the forest. Man has not touched this place. His pollution has not reached here. In this domain another rules. One who is immortal. One who has been born and died many times. Animals do not fear this place. They are safe here for this is the home of their protector. This is the home of The Horned God. In the clearing He appears. Tall and strong is He, a powerful looking man but he is more than man for crowning his head are the horns akin to the great deer. He is armed with weapons but while he carries a sword on his hip, it has not been drawn in anger. His tall oak shaft spear now a staff of power that he uses to walk through the lands. His bow and arrows not used to hunt but to protect. Bright eyes look about the clearing with the alertness of a man skilled in the hunt. Bright and wise they cast over the domain of the world and those who live in it. A jovial face, bearded with thick bushy brown hair, smiling as he sets down his weapons and sits beside the water. It is the Summer and The Horned God is home. As we approach the coming Lammas and the first harvest and celebrate making offering to the Goddess from the harvest, it is important to remember too that the Summer is the season of The Horned God. As a nation of sun worshipers, Australians all enjoy the gifts of Summer. Though I appreciate the gift of air conditioning on those hot summer nights. Mind you so far this season I have not needed the air conditioner, in fact right now a cold breeze is coming in the window, the sky is grey and there is a misty rain in the air. None the less, it is Summer and The Horned God watches over us. I find for me the simplest working I can do invoking the power of The Horned God is to go stand outside in the morning sun. I face the sun, eyes closed and my arms out stretched. My palms open, turned so they too face the sun and I allow the energy from the sun to warm me in its powerful embrace. As I do, I call on The Horned God to lend me His strength and guide me. As I stand there I can feel the energy building up and then flowing through me, washing away negative energies to be cleansed in the earth. I stand there drawing in the power of The Horned God and recharge with His positive energy. 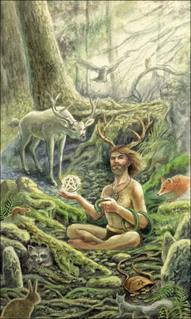 The Horned God is often seen as Pan, god of shepherds and flocks, of mountain wilds, hunting and rustic music, as well as the companion of the nymphs. Another working I use is music. I play my Native American Flute. I love taking it and going out into nature, sometimes it is the local city park, sometimes the river bank. Often it is the evening as the sun sets on this part of the world. There I will sit and start to play and sometimes sense the nymphs dancing in the trees nearby. 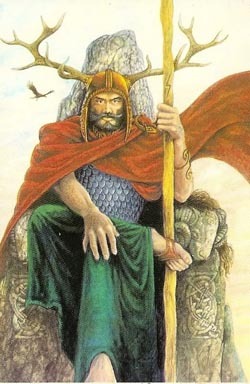 As my notes float through to the sky, I am connecting to The Horned God and honoring Him. Now not everyone can play an instrument. Ask me to read sheet music and I may as well be trying to read a text in another language. What I believe is that if you just open yourself up to The Horned God and sing, beat a drum or play any instrument you can play then you are sharing the gift of music with Him. For me the Native American Flute allows me to play from the heart; and isn't that where worshipping the Gods should come from, the heart? Some people have asked why I work with The Horned God so much. I am not neglecting The Goddess. I celebrate them both. On my altar there are representations of both The Goddess and The Horned God. I call to both in prayer and ritual. For me Paganism is about balance. Light and Dark. Life and Death. Male and Female. So many books on Wicca and modern Paganism seem to focus on The Goddess and where The Horned God is mentioned He is a supporting character there to serve a function such as giving The Goddess the gift of new life growing within Her. Summer is the season of The Horned God. It is when we feel his power most strongly. The land is alive. The days warm and long, well traditionally anyway. The Horned God is always present in our lives. Soon his power will wain. He will age and die as the season turns. The warm summer will give way to the fall and the Autumn. The Goddess will carry Him within to be re-born anew. In this Summer season, go out into the world. A new year has come and we look at it with new eyes. Look to The Horned God and The Goddess to guide the way. Seek out the gifts they give you and give thanks. Herne Who Hears All Living Things - Hear Our Call To You! Herne Whose Name All Nature Sings - Hear Our Call To You! Draw Near, Come Here, Be Here, Now! The Magus is generally viewed as the possessor of occult secrets, a master of esoteric wisdom, who makes use of this knowledge for his or her own good and supposedly for that of human kind. 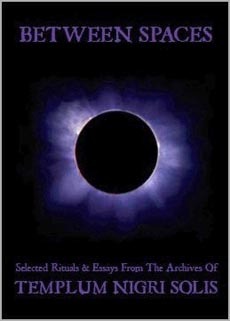 For the most part, these occult secrets appear in the form of magic requiring the participation of demons or spirits. The term "Magus" or "Magi" seems to have several meanings including wise men, magicians, and magians. The Magus is the singular for Magi. Well known Magi are Merlin, Faust and Simon Magus. The earliest writings concerning the magi are from those of Herodotus (Greek historian, 485-425 BC). He cites them as one of the five social classes of the Medes. The Medes were the Magi or "Enchanters" of Old; they were people of Indo-Iranian (Aryan) origin who inhabited the western and north-western portion of present-day Iran. The Magi were a hereditary caste of priests of the Zurvanism religion that evolved out of Zoroastrianism. The name Magi implies a link with the Sumerians, who called their language Emegir, over time becoming simplified to Magi. The Magi are distinguished in both Egypt and Chaldaea. In Egypt they were said to possess secret learning and wisdom. Also in Egypt and Chaldaea they were the sole seers and interpreters of sacred things in the past and future. They were also considered a sort of sacred scribes among the Jews, skilled in divination and the interpretation of certain scripture passages for hidden meanings. Magi are strange creatures of knowledge, they are the alchemists, and their source of power comes from study, comprehension, preparation and application. 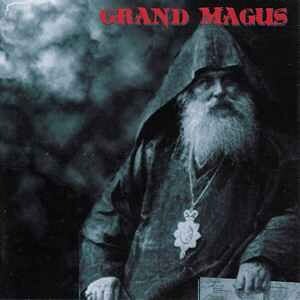 The Magus tends to eschew the spiritual and to trust in what can be seen, felt and held - however esoteric. They are sometimes confused with shamans who are concerned with the spiritual and get strength from that source. People who are considered to be Magi are generally learned and in touch with the science of nature and the cycles of the cosmos. In today's society the Magus would no doubt be applying the basic principles of quantum mechanics and electromagnetic theory in their magical work. One wonders with the right knowledge and determination if anyone can become a Magus, whether this ability to enact magick is innate in all people, or whether it is given to only a certain few. It is believed however that this power comes from the diviner's mastery of him or herself, through self-control, and the mastery of the mystical arts. Once such control is attained then the person gains a greater understanding of the laws of the universe and can utilise this new power to gain a better relationship/partnership with the natural environment. This time I thought I would write about one of my favourite novels, THE MISTS OF AVALON!! 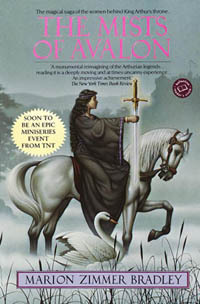 The Mists of Avalon is a 1982 novel by Marion Zimmer Bradley, in which she relates the Legend of King Arthur from the perspective of the women in his life, narrated in first person by Lady Morgaine (or Morgan Le Fay). It´s quite a long book so you really get into the story, I actually felt very nostalgic when coming close to the end. "Ms. Bradley follows Morgaine from childhood to Priestess in her home on the Isle of Avalon, the centre of Druidism and Goddess worship since the Roman occupation forced the religion underground, where it remained long after the Roman departure. Mists surround this mystical isle, protecting it and its inhabitants from all who do not have the psychic powers to penetrate the barrier. Morgaine has dedicated her life to preserving her ancient religion and tries to defend it against the growing numbers of her countrymen and the Camelot royalty who exchange the old ways for Christianity. She is also a very powerful person and struggles against the stereotypes which expect her to adhere to more traditional 'feminine,' (dependent), behaviour and roles." From A Novel Take On A Classic Tale - Superb! !, By Jana L. Perskie. Music is strongly linked to ritual all over the world, and it provides us with the means of communicating a wide variety of emotions which is sometimes difficult to verbalise. Music can be expressed simply in ritual whether it is through the instinctive movements of clapping or stomping our feet or the banging of a drum. The first musical implements used in rituals at the beginning of human evolution were probably sticks used on other sticks or bones or stones. The Silver Branch is also known as a bell branch or apple branch and is a percussion instrument that works in a similar manner to the shamanic rattle and the drum. "Craebh ciuil" is Irish Gaelic for musical branch. In the Irish Druid tradition, the Silver Bough is cut from a magical Apple tree, where silver apple shaped bells played a mystical tune, which could lull people into a trance state. Druids could make contact with the Otherworld during a trance enhanced by this silver apple bough. 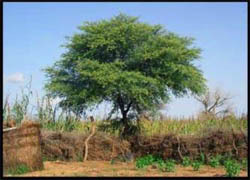 Traditionally a silver tree branch contained silver or golden apples that sounded like bells attached to it. Sometimes three, six or nine apples hung from the silver branch. Apple, hawthorn and oak were most commonly used for the making of a Silver Branch, but any tree you feel a strong connection to will do. If you are removing a branch from a tree make sure to thank the tree before taking the branch. If you don't want to use a branch you can use a length of dowel instead. After stripping the branch and sanding it, you can then paint your branch silver or you may prefer to wrap it with silver thread or ribbon. You can then add bells tied on to the branch with ribbon or wire; choose a multiple of three, as three is a very sacred number in Celtic mythology. Jingle bells and horse bells are most common, but any type of bell is good. Silver, gold, copper or bronze bells are traditional. The bells should have a pleasing sound that is clear in tone so try out different bells to find a sound that feels right for you. You can attach the bells close to the branch or allow them to dangle. Add any carvings, painted symbols, feathers and other decorations that appeal to you. You may want to add your magickal name in ogham or runes on the handle. Ever felt like Spirit is leading you up the garden path, nicely of course, but leading you all the same. I have been pondering whether to research Egyptian herbs but just hadn't got around to it, when I started researching the herbe for January Axis Mundi. Low and behold a herbe used by the Egyptians found me! Crystals ~ Serpentine: What's in a Name? 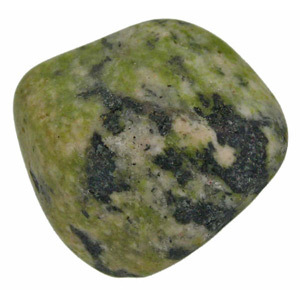 Serpentine colours range from green, yellowish, brown and often covered with spots. It has a greasy to silky lustre and is sensitive to acids. At times serpentine has been sold as jade due to the varied trade names. Serpentine is classified under the element of fire. Fire relates to ambition, achievement, inspiration, all creative and artistic ventures, but it is also potent in destroying what is no longer needed. Now that we are at the beginning of a new year, we have an opportunity to see what the energetic overview is for 2011. 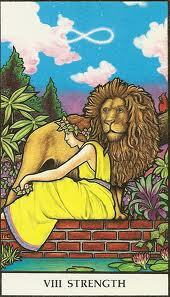 The card selected for this reading is the Strength card which signifies triumph over the challenges that we may face throughout the year. The Strength Card represents the power of our inner strength. In the Connolly deck, we have the image of a woman sitting next to a lion in deep contemplation. The lion represents determination, courage and power. The woman is the seeker; she has no fear of the lion which in turn appeases the lion's urges with gentleness and patience. She represents higher consciousness, which is more powerful than our animal instincts. She sits on a solid brick wall which implies that she is totally supported on strong foundations through her determination and self-discipline. Courage is an important aspect of this card, it takes a great deal of courage to look within and create change within our self. We are also put on notice not to give up so easily when situations become difficult especially when one could be so close to the finish line. The Strength Card is also associated with the number eight. 8 is the eternity symbol and deals with balance, time, and the ongoing recycling of energy. Eight also represents power, judgment, renewal and accomplishment. Tarot card is from the Connolly Deck. The following information (contributed by Jenwytch) is from www.akashawitchcraft.net (website no longer available). Lammas is the traditional time of Harvest, and preparation for the coming winter months, celebrated on the 2nd of February in the Southern hemisphere, and on the 2nd of August in the Northern hemisphere. Lammas is awareness of the approach of winter, and thanksgiving for the year's harvest. The name Lammas derives from the Old English Hlaf-Mass, which means "bread feast". Lammas is traditionally the festival where the first loaf of bread from the harvest is broken and shared in the name of the Goddess. All crops associated with bread are sacred to this time, in particular barley. The drinks of the season are beer, ale, cider, and all things brewed. In Australia, Lammas is an ideal Sabbat to spend down the beach on hot summer evenings, sipping cool drinks and honouring Mother-Sea by appreciating and respecting her cooling waves. Lammas is a harvest not only of crops, but of all that we have sown through the year, and so it is a good time to wander the beaches with a garbage bag, cleaning up the mess that thoughtless people have left behind, and doing our best to restore Mother-Sea to her natural glory. Unfortunately, part of the harvest at this time is also the sad and distressing harvest that animal charities face when inundated with unwanted animals that had been Christmas presents just a few weeks earlier. Lammas is a good time to emphasize the importance of all Her creatures by supporting animal charities with donations of time and/or money. In this way, we can help ease the lives of unwanted animals and, when necessary, help with their passing into the next world where they will hopefully find true love and companionship according to their kind. 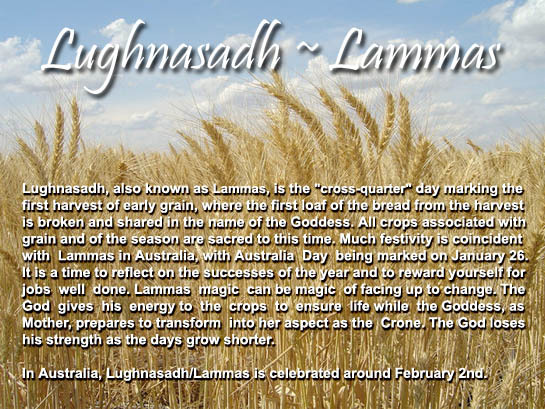 Lammas is the celebration of harvest, and ties in with Lughnassadh, the Celtic festival in honor of the Sun God, which is held on the 7th of February in the Southern hemisphere, and the 7th of August in the North. Tradition tells that the Sun King gives his energy to the crops to ensure life while the Mother prepares to transform into her aspect as the Crone. Lammas is the time to teach and to share the fruits of our achievements. The baking of bread, the gathering of seed for the next year's sowing, and the making of corn dolls are all traditional at Lammas. The altar is decorated with loaves of freshly baked bread, corn dolls and wreaths, and the fruits and vegetables of the harvest. Lammas is a time to share, be thankful for our blessings, and be joyful for the blessings that are to come. Lammas is also known as Cornucopia (Italy/Latin) and Thingtide (Teutonic). A wonderful Harvest festival incense. Don't let the remainder of the beer go to waste! 1. Preheat oven to 150 deg.C. Line 2 baking trays with baking paper. Place egg whites into a clean bowl. Beat with electric beaters until soft peaks form. Gradually add caster sugar, beating well between each addition. Beat until mixture is thick and glossy this will take at least 5 minutes. 2. Spoon heaped teaspoonfuls of the mixture onto baking trays. Flatten meringue into a disc. Bake for 20-25 minutes or until crisp. Cool completely in the oven with the door ajar. 3. 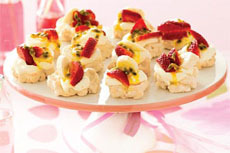 Top meringue with cream, and decorate with fruit. Serve immediately. This is a 2 hour workshop to learn how to conduct a space clearing in your home or place of business. Click image above to see the Lotus website. 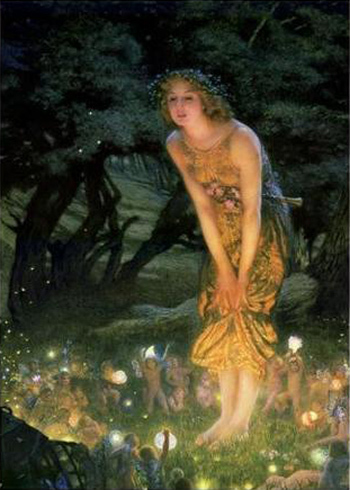 This is a 2 1/2 hour workshop to explore the workings of spells and magick. You will be taught the basic techniques for casting a spell, plus you will have an opportunity to participate in a hands-on session where you will be guided to perform a spell on your own. Spell casting is a technique that assists individuals to magically enhance their spiritual and material lives through empowerment and motivation. Janine Donnellan from Spheres of Light, will be the facilitator of this workshop where you will be given the basic instructions to help you manifest your own desires. 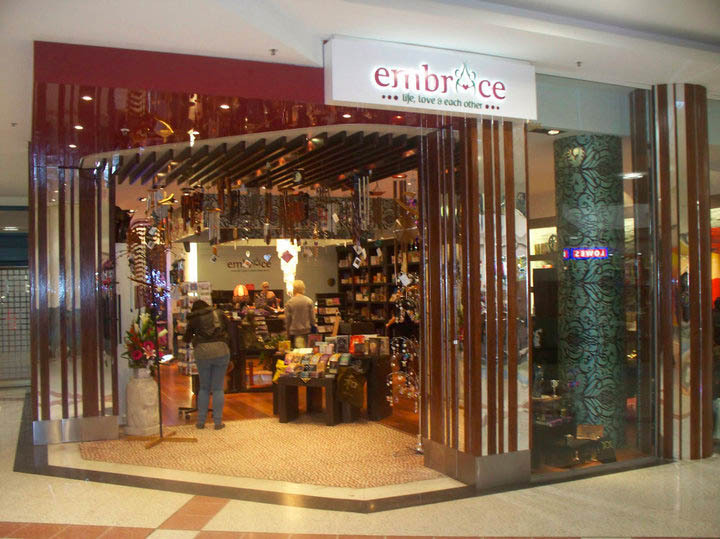 Cost: $60 includes refreshments, notes and a coloured candle & crystal of your choice. 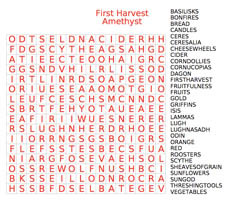 Click on the wordsearch image to download and print the First Harvest Wordsearch (pdf).